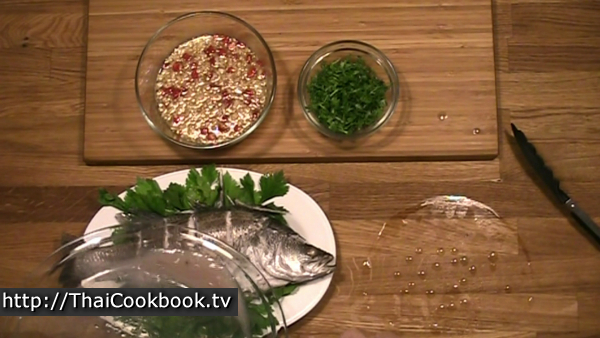 Steaming is such an excellent tasting and healthy way to cook fish. This recipe for Plah Kapong Neung Manao has a deliciously fresh salsa topping that is made with hot chili, garlic, and cilantro in a sweet and sour lime juice base. The fish we cooked is the Barramundi, or the Asian Sea Bass, but this recipe can be used with many different types of fish. In Thailand we always cook the whole body of the fish, including the head, as cooking the fish this way releases a lot of flavor from the bones. However, you can do this recipe using filleted fish if you prefer. 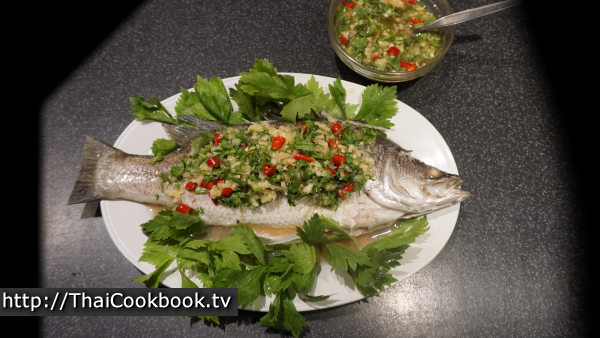 What's in our Steamed Sea Bass with Chili, Lime, and Garlic. 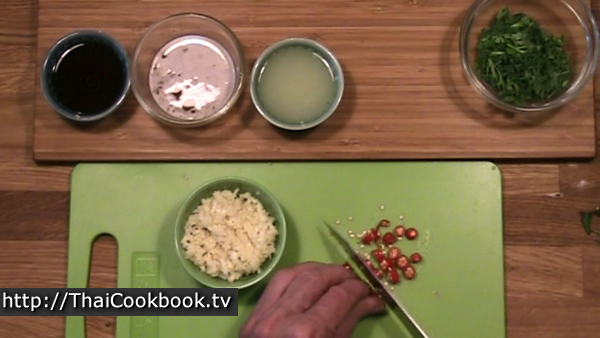 How we make our Steamed Sea Bass with Chili, Lime, and Garlic. 1) Dissolve the coconut sugar in a little hot water, then mix it together with fish sauce, lime juice, chopped garlic, and hot chilies. Let it marinate for 10 minutes. 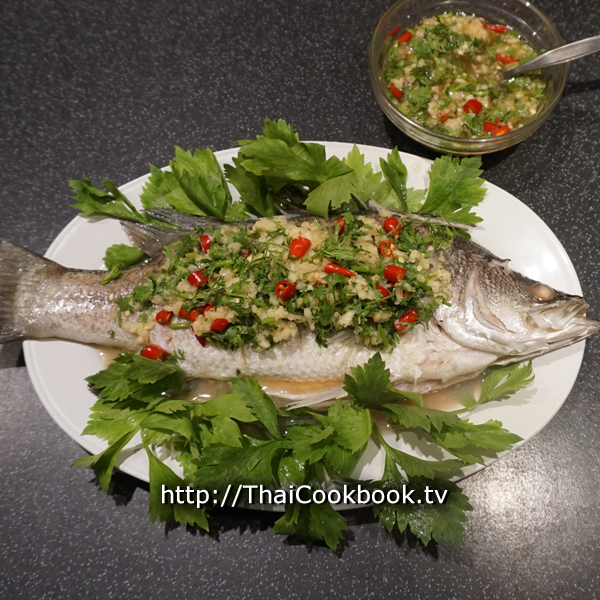 2) Steam the whole fish for 7 - 10 minutes or until fully cooked. 3) Place on a serving platter with Chinese celery leaves and chopped stems. 4) Add the chopped cilantro to the sauce and then spoon over the hot fish. Serve with steamed rice and other foods. To do this recipe we recommend using a whole fish, but be sure it is short enough to lay out flat in the steamer that you'll use. 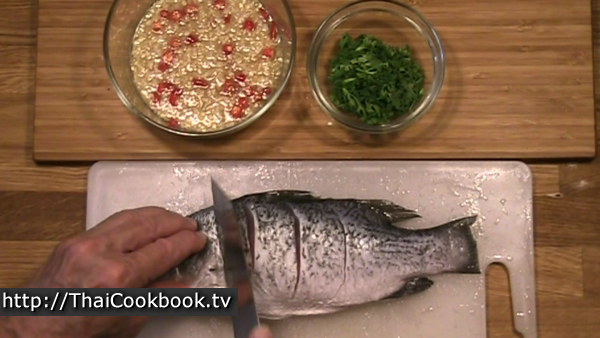 Here we used an Asian Sea Bass, but you can use whatever type of fish that you like. Just clean, scale, and remove the intestines, but leave the head on for more flavor in the pan drippings. You don't have to eat the head, and if it bothers you, you can remove it before serving. I like to use coconut sugar whenever possible, as it give the recipes a candy-like flavor that refined sugar just doesn't have. Because our "salsa" is not cooked, we need to dissolve the sugar first before mixing it with the other ingredients. Here I just used 2 tablespoons of sugar and one tablespoon of water, heat it for a few seconds in the microwave, then stir it up well to make a thick coconut sugar syrup. Don't let it boil, just get it hot. Squeeze some fresh limes, chop the garlic and cilantro, and cut the chilies. The finer you chop hot chilies, the spicier the salsa will be. Here I used about 3 - 4 Thai hot chilies, but if you prefer to make a mild salsa, you can use sweet red pepper, or even mix them to tone it down some. It will still taste great. Stir together the dissolved sugar syrup, fish sauce, and lime juice. Add the garlic and red chili and stir it well. Do not add the chopped cilantro until just before serving so it stays nice and fresh. Let it sit and marinate for about 10 minutes, which is just about enough time to steam the fish. This fish it just a little long for my steamer, so I cut the tail off a little. Cut the thicker sections of the fish body across, all the way to the bone in 2 or 3 places. Do this on both sides of the fish to help it cook evenly. Lay the fish in an oven safe dish that will allow a little space all around once it is in the steamer. I used a glass pie plate. I like that I can see through it, and it is deep enough to catch the juices from the cooked fish. 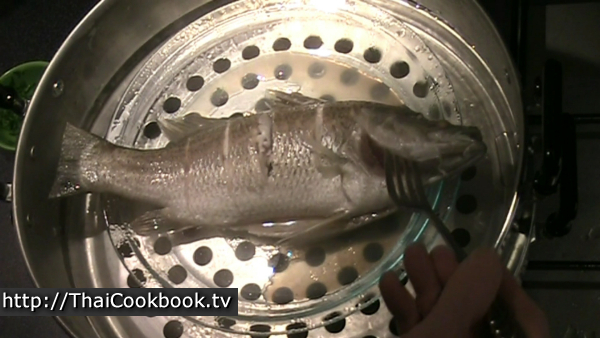 Steam the fish for about 5 or 6 minutes, then check it to see how it's doing. It is done when you can pull the fish away from the center bone at the thickest portion. The head and jaw bone will be loose and easy moved. Raw meat will be clear, so if you see clear fish just cook it a little more. This fish took about 9 minutes. In Thailand we serve a fish like this in a special metal platter that has a little charcoal fire under it to keep the fish warm, but here I show you that it can be done on a plain platter. Just serve immediately while the fish is still hot. I used Chinese celery tops on the side. They make a nice garnish, but we eat it along with the fish and salsa as a kind of salad. 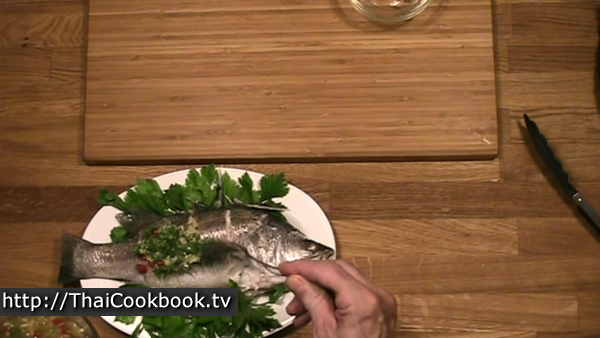 Transfer the fish to the serving platter and pour all the juices left in the cooking plate over the fish. 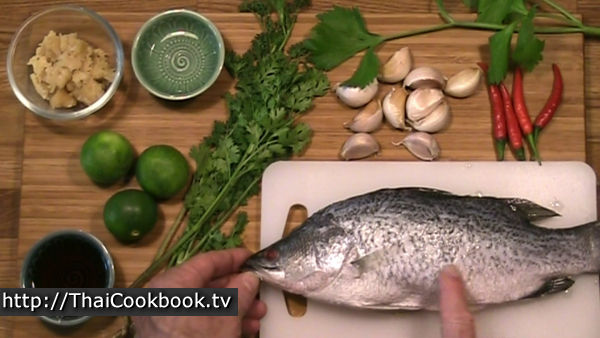 Add the chopped cilantro to the salsa and stir it up well, then top the fish with about half of it. Serve the remaining half of the salsa in a small bowl on the side. 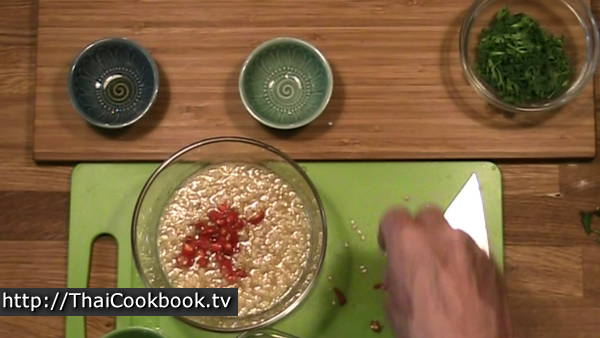 Serve immediately with hot steamed rice and other foods. In Thailand we eat it by flaking the fish off the skeleton with a spoon and fork, then eating it with rice and the sauce until the first side is gone. Turn the body over and this point and add the remaining salsa.